In 1991, John Fawcett set up in Bali the “Sight Restoration and Blindness Prevention Program”. From its initial decade of success came the establishment of the not-for-profit John Fawcett Foundation (JFF) in March 2000. Its Indonesian arm, Yayasan Kemanusiaan Indonesia (YKI), was established in November 2001. JFF/YKI’s mission is to relieve sickness, suffering and distress in poor and remote families in Indonesia free of charge and without religious, political or ethnic consideration. The purpose of the Eliminating Avoidable Blindness – One Banjar at a Time project is to demonstrate that avoidable blindness can be eliminated in a targeted population in a selected banjar on the island of Bali, Indonesia, with successes rolled out through a rigorous replication process to other poor Balinese banjar expressing a willingness to partner and contribute in-kind support. provide comprehensive eye examinations to an estimated 200 elementary school children providing eye glasses and medicines when necessary. The John Fawcett Foundation mobile eye clinic, fully equipped and complete with its professional medical team, will make a visit to the selected banjar with the objective of eliminating avoidable blindness among its residents and to sustain the success of the project through an education program targeted at elementary school children. 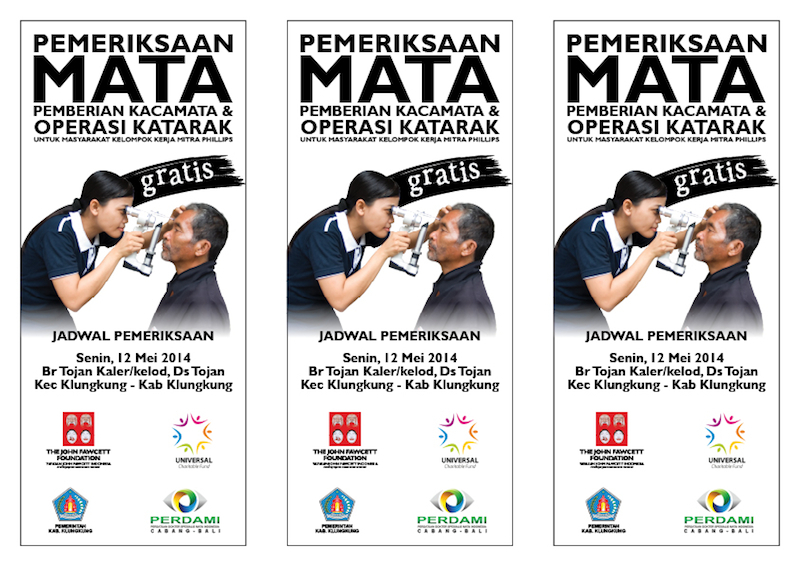 UCF was pleased to approve a grant of $2,000 to help in this vital work to improve the eyesight of the Balinese. * banjar is the smallest administrative unit of a village (desa) on Bali.